About 16 years ago, I was working for Universal Pictures International when the company started to refurbish the offices. During the renovations, they threw away two brown leather chairs (these). At the time, I wasn’t aware of what they were (Eames Aluminium chairs). I just loved how they looked (beautifully designed) and I thought they would look great with the first ‘grown-up’ piece of furniture I had bought: a Robin Day leather sofa (do you remember when Habitat had it in-store!?) to furnish my flat in Stoke Newington. Little did I know that they were designed by Charles & Ray Eames and produced by Vitra. Since then, I have developed a profound love for Charles & Ray Eames’ designs and consequently for Vitra so I was super excited to fly to a two-day press trip to the Vitra Campus in Weil am Rhein, just outside Basel, Switzerland, which turned out to be pretty full on, very tiring but also very inspiring and interesting. During a trip to the US in 1953, a young man named Willi Felhbaum fell so much in love with a chair designed by Charles & Ray Eames in the window of a furniture shop that he decided to become a furniture manufacturer and founded Vitra. Later on, he met up with Charles and Ray Eames and they all developed a lasting friendship that has shaped the company ever since but also the close relationship Vitra maintains with its contemporary Designers. Other Designers joined in like American industrial Designer George Nelson, Jean Prouvé (several of its Potence wall lights can be seen in the Vitra café) and Danish Verner Panton who launched his Panton chair, the first cantilever chair made out of plastic in 1967. Too daring for its own good at the time, the Panton chair was a design that many manufacturers refused to produced until Rolf (Felhbaum, son of the Vitra founding family) saw its potential and called Vitra technician Manfred Diebold. Diebold met up with Panton and returned with glowing reports. 1963 marks the start of the collaboration between Panton & Vitra and the development of one of the most iconic chair designs of the 20th century. I have visited numerous, great design museums but the Vitra campus is something else and gathers together amazing architectural buildings designed by the likes of Zaha Hadid, Frank Gehry, Herzog & de Meuron, Nicholas Grimshaw, Alvaro Siza and SANAA where each building has its own function. The fire station (featured above) broadcasts short-films that Charles and Ray made in the 60s, while the Schaudepot hosts a collection of over 400 chairs and the furniture experiments of the Eames couple. The Vitra Haus (below) shows a unique collection of iconic, new and vintage Vitra designs in-situ and each year, Vitra gives carte blanche to a few Designers to re-think and create an entire floor. We visited those floors late at night and I was too tired to take any pictures but you may have seen in my stories at the time, the amazing Alice in Wonderland scenery created by French Architect India Mahdavi or the wood workshop designed by Jasper Morrison. The real turning point was when Vitra entered the domestic market in 2004 with their Home collection and they started working with contemporary Designers like Antonio Citterio, Jasper Morrison, Alberto Meda, Maarten van Severen, Ronan and Erwan Bouroullec, Hella Jongerius and Barber Osgerby to name a few. 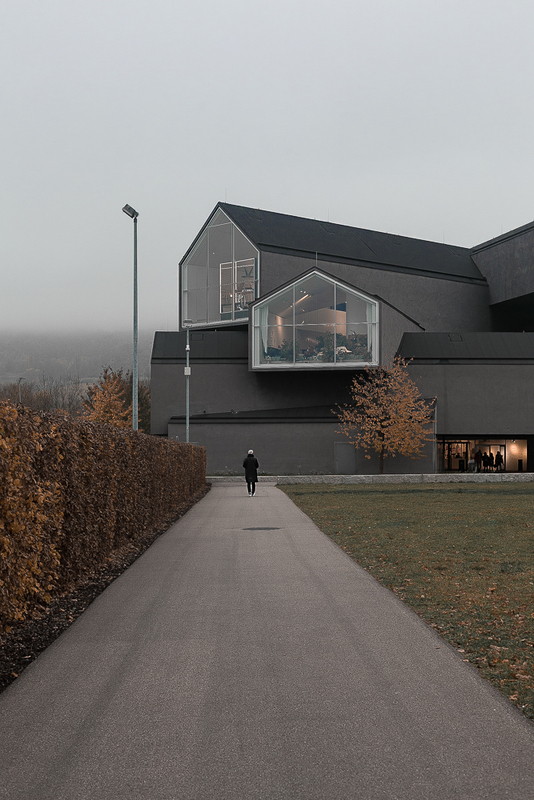 To these days, Vitra still develops all their products in Switzerland and manufacture them in Europe. We spent two full-on days there and between guided tours, all the museums, movies to watch, there is a lot of things to see. There are also a couple of nice cafés to hang out and if you’re brave enough and not suffering from vertigo you can even go down the Vitra Tour Tobbogan designed by Carsten Höller. I managed to go up to the second floor which gives you a fantastic view on the campus. HOW TO GET THERE: We flew to Basel airport (Switzerland) which is 15 min drive but you will find more info on the Vitra website. WHERE TO SLEEP: We stayed in the Nomad Design hotel which I thought was great. I took this picture in their stairs between floors. Disclaimer: I was invited by Vitra, which means they covered all expenses in relation to my 2-day visit. Only a minor hint: Even though Vitra is a Swiss Company, the Vitra campus is located in Weil am Rhein / Germany.